The 2015 Fort Lauderdale International Boat Show, which takes place at seven locations from Nov. 5-9, offers an expedient parking and transportation network of bus shuttles and water taxis with convenient pick-up and drop-off locations, as well as dedicated parking lots, designed to make reaching the show easy from any direction. The Fort Lauderdale International Boat Show takes place at the Bahia Mar Yachting Center, Hall of Fame Marina, Las Olas Municipal Marina, Hilton Fort Lauderdale Marina, Pier 66 Marina, Sails Marina and Greater Fort Lauderdale/Broward County Convention Center. Purple Bus: To/from War Memorial Auditorium parking and Las Olas Marina. Green Bus: To/from Bahia Mar Yachting Center, the Sails Marina and the Convention Center. Blue Bus: To/from Bahia Mar Yachting Center and the Convention Center. Yellow Bus: To/from War Memorial Auditorium parking and the Convention Center. Red Bus: To/from Huizenga Plaza (Bubier Park) and the War Memorial Auditorium. For more information about FLIBS parking and transportation, including maps, visit FLIBS.com/parking. The Fort Lauderdale International Boat Show® is owned and presented by the Marine Industries Association of South Florida, managed and produced by Show Management and sponsored by Audi, Auberge Beach Residences, BoatShowHotels.com, Budweiser, Four Seasons Fort Lauderdale, GEICO, Gosling’s Rum, Palm Harbor Marina, QuintEvents, Smallwoods Yachtwear, Sun Sentinel, Taiwan External Trade Development Council (TAITRA), and ULYSSE NARDIN. Like the Fort Lauderdale International Boat Show on Facebook at facebook.com/fortlauderdaleboatshow, follow the show on Twitter at twitter.com/boatshowupdates, connect on Instagram at instagram.com/showmanagement, and tune into Boat Show TV at youtube.com/showmanagement. 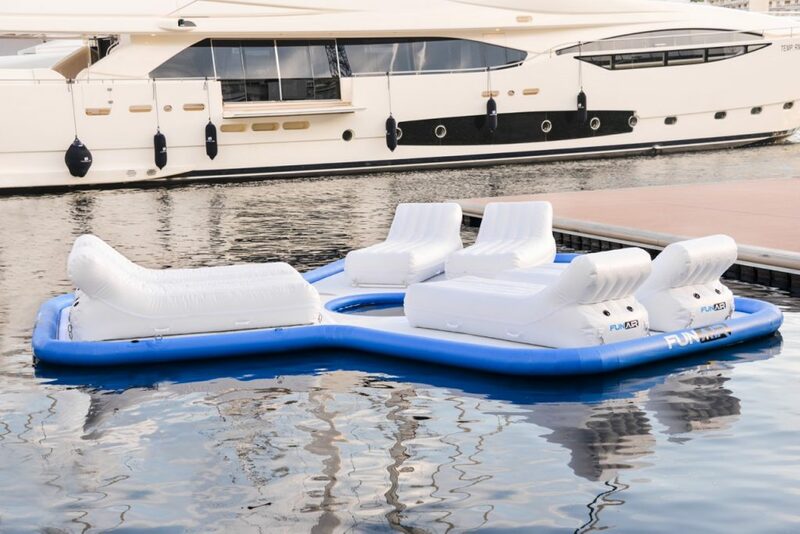 Known for making adrenaline pumping inflatable yacht products, FunAir has plans to bring even more fun to the Fort Lauderdale International Boat Show this year. Following a hugely successful Monaco Yacht Show, the team will take their new Floating Island to FLIBS for its first taste of the American market. Sharing on water space with partners National Marine Supplier at booth F608, FunAir has a hot new location nestled between some of the largest megayachts on display at the show. Their inflatable yacht slides and the super popular climbing wall will also be prominently featured. 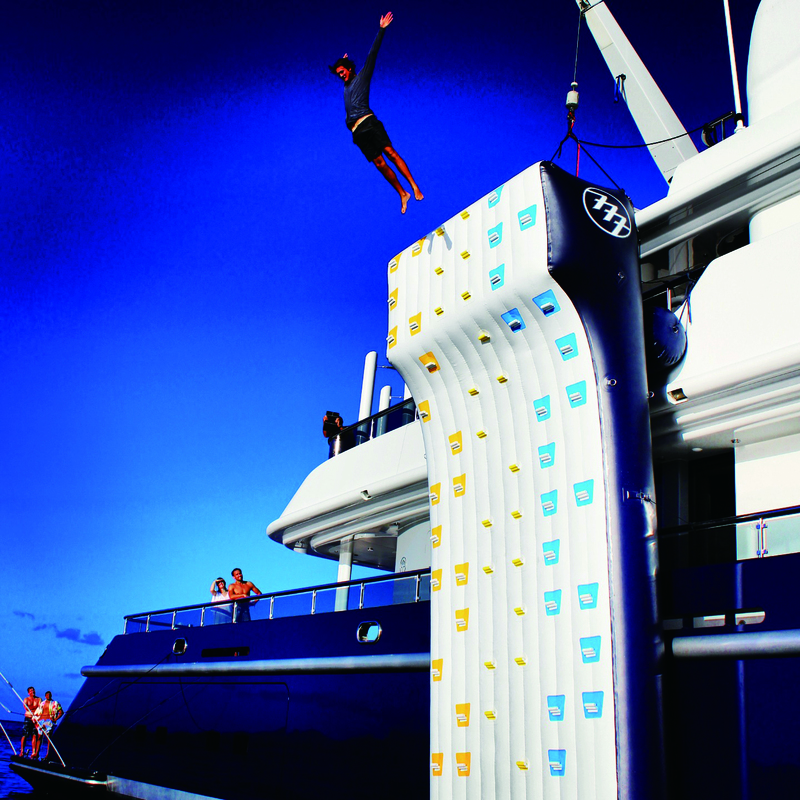 The inflatable climbing wall was one of the first products added to FunAir’s portfolio in 2013. Leaders in safety (and of course fun) FunAir installed auto belay system anchors on the tallest walls and unique hand holds which make the wall significantly more user friendly than other climbing walls in the yacht market. This past summer, FunAir shipped two of the tallest inflatable climbing walls ever made to the United Arab Emirates; with several more in production at the moment. At 10 and 12 meters respectively, each wall has best in class safety features. Their patented RapidFlate system inflates and deflates the product six times quicker, making the product simple to manage for crew. Find the FunAir team at the NMS on water display area located next to booth F608. FunAir are the exclusive North American partner of NMS and will be happy to discuss your global yacht supply needs. How to do Monaco Yacht Show like a boss! We all enjoyed Monaco Yacht Show, we always do. But did we all make good business? This will very much depend on your strategy, your product, and lets face it, the money you invested on your presence at the show. 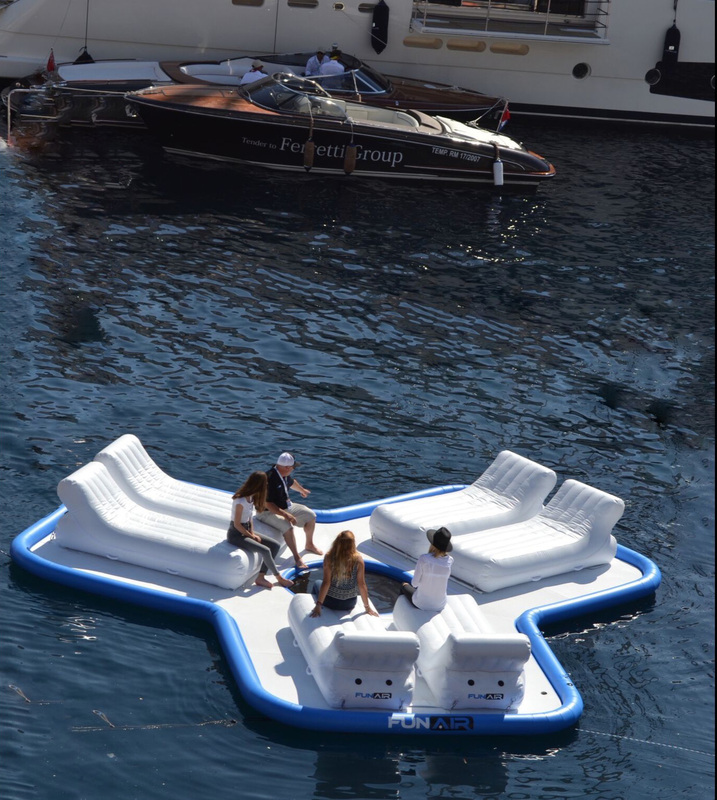 Global Superyacht Marketing supported leading inflatable yacht toy company FunAir for the 2015 MYS. How did they do? We hear you ask… The quick answer is they had the best boat show in terms of business in and brand exposure they have ever had. There are several reasons for this and they provide invaluable learning for other businesses wishing to do the same. First and foremost FunAir worked WITH Monaco Yacht Show. So many businesses try and fly under the radar at the worlds most prestigious yacht show. Put off by waiting lists and the cost of exhibiting there, they often decide to adopt a guerrilla marketing approach. Bad idea! Not only is it disrespectful to the show, it is also a waste of time. 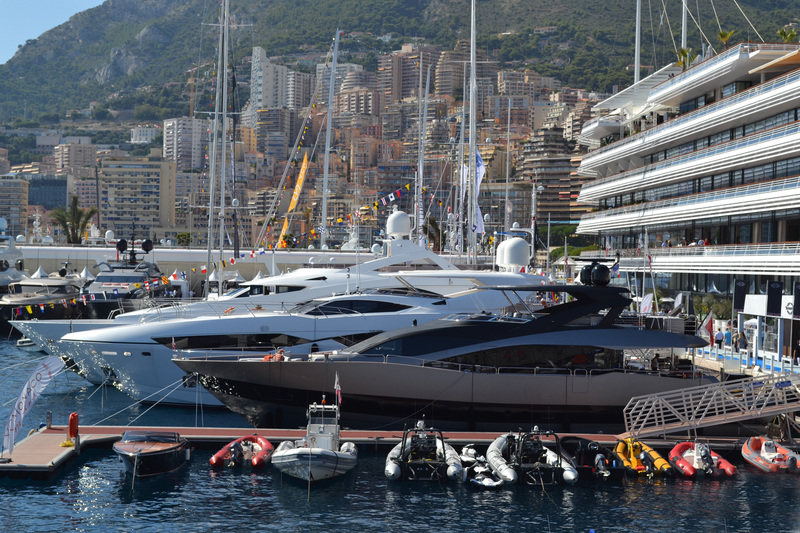 Monaco is probably the fastest paced yacht show on the planet. Everyone is super busy often with back to back meetings. Wandering around the show handing out some leaflets simply won’t cut it, and if you do manage to get that leaflet into the hands of the right person, they certainly won’t remember you by the end of the show. They barely remember their own name by the last day. Another benefit of working with the show is that you are registered as attending, you will show up on the exhibitors list, your business will have presence on the Monaco Yacht Show website and in the show catalogue. It is surprising just how many visitors will use both the website and show catalogue as a tool to pre-plan who they are going to visit during the show. The media will also use these guides to decide whom they are going to talk about. Try not to miss out on valuable brand mentions by trying to buck the system. FunAir chose to sponsor the Captains and Crew Lounge this year. Although not the cheapest option, from personal experience money just can’t buy the level of exposure this type of sponsorship package gives you. FunAir had the only in-water display for their brand new product launching at the show. Plus the FunAir Floating Island was viewable from every angle of the Captains and Crew Lounge. You couldn’t miss it. With hundreds of crew using this facility every day, both the FunAir brand and their new to market product is now firmly at the front of each crewmembers (and captains) mind. There is no point investing money on doing a show and then not telling anyone about it, especially if you are launching a new product or service at the same time. Make sure you have a comprehensive media plan, press releases and social media activity mapped out well before the show. Make sure you have top-notch images to support your key messages and if you don’t have the contacts yourself, use a trusted marketing company such as Global Superyacht Marketing to send your messages out to the industry as a whole. 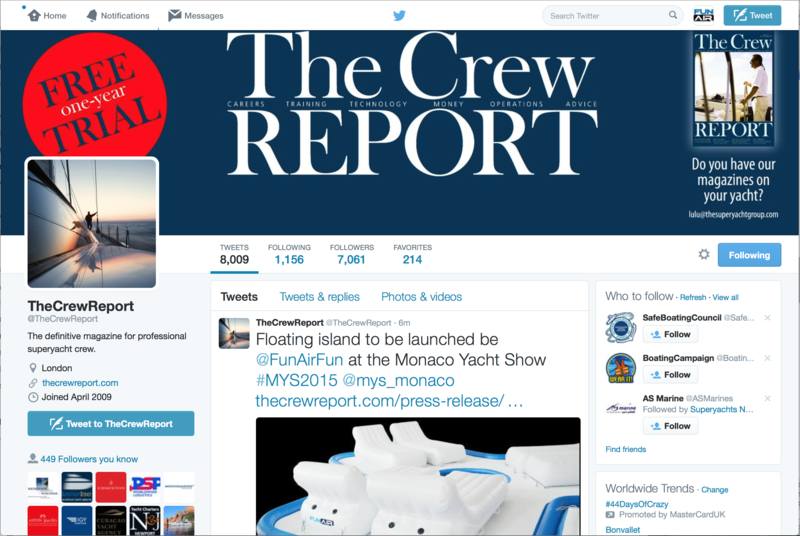 We worked on three key press releases for Monaco Yacht Show. Released on the lead up to the show with the final release going live on the first day. Social media backed up the press releases, and then as the coverage came in, each article was supported, retweeted, liked and shared throughout the show. FunAir received more press coverage than ever before, they had over 40 individual articles and online mentions, the social media element of the show recap report was 47 pages long just to fit in all the brand mentions and positive features. Yes it helps that FunAir are cool, yes it helps that their products look amazing and are for having fun, but without the investment in making this the most important show of the year for them, they wouldn’t have gained the exposure and consequent business. If you want to find out more about how to maximise your boat show experience, or need help with press coverage and social media please contact the Global Superyacht Marketing team.